Vol. 28, No. 4 features protests against the Koala, Halloween festivities and history, the rumor of the library being haunted, and the campus Improv team. 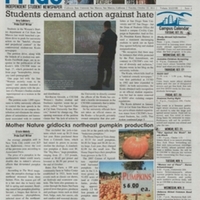 October 25, 2011,” University Archives at the CSUSM Library, accessed April 18, 2019, https://archives.csusm.edu/student-newspapers/record/498.